As a special project to mark my retirement from teaching in 2015, I am going to hike the Coast to Coast Walk from August 23 to September 5, 2015 — fourteen days of walking through some of the most beautiful areas of northern England. 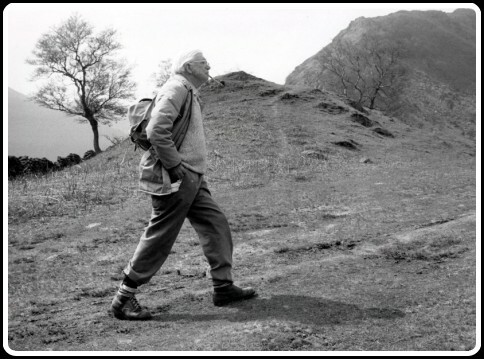 The Coast to Coast Walk was devised by famed fellwalker Alfred Wainwright in 1972. Although it is one of the most popular long-distance trails in the UK (equivalent to the Bruce Trail in Ontario, which runs from Niagara to Tobermory), the Coast to Coast is not an official, national trail. It runs for 192 miles (309 km) across the northern neck of England, traversing three very different — and very beautiful — national parks: the Lake District National Park in Cumbria, near the north-west coast; the Yorkshire Dales National Park, which also has the Pennine Way running through it; and the North York Moors National Park, which is close to the north-east coast. Most hikers who tackle the trail walk it west-to-east, in order to keep the wind and the sun behind them. The trail begins, therefore, on the west coast of England in St. Bees, Cumbria - a small village on the north-west coast, about five miles (eight km) south of the town of Whitehaven. St. Bees overlooks the Irish Sea, with the Isle of Man lying to the west about half-way between the English coast and Northern Ireland. The Coast to Coast Walk ends on the east coast in the Yorkshire village of Robin Hood's Bay, about five miles (eight km) south-east of Whitby, overlooking the North Sea. 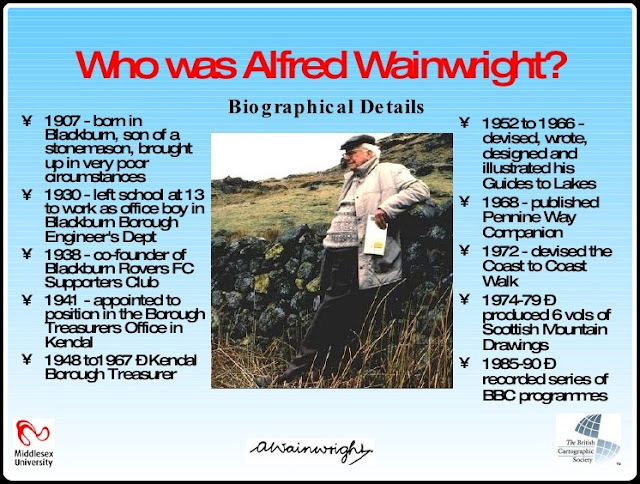 Alfred Wainwright was born in Blackburn, Lancashire in 1907. He was raised in the city and began his working career there as an accountant. Even as a young lad he was a keen long-distance walker. He also showed an early interest in cartography and drawing. Wainwright's long love-affair with the fells (hills) of the Lake District began in 1930, at the age of 23. He spent a week's holiday there with his cousin Eric Beardsall. In 1941 he moved to the Lake District, taking a cut in pay to do so, working as an accountant in the Borough Treasury Office in Kendal, Westmorland. He would live and work in Kendal until his retirement in 1967. He died in 1991. In 1952 Wainwright began work on the first of seven hikers' guides to the fells of the Lake District. The series was dubbed A Pictorial Guide to the Lakeland Fells. 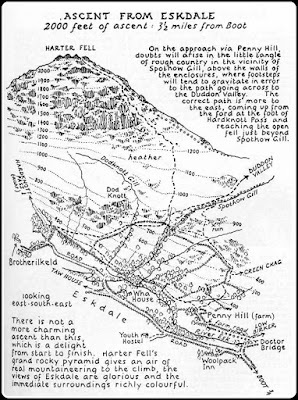 The first — a guide to the Eastern fells — came out in 1955. Six more volumes followed over the next 11 years, an average of a book every two years. He produced about one page every evening. These guides are unique because all of the illustrations and maps are hand drawn by the author, and the text also features Wainwright's own hand-lettering, instead of being printed using a traditional typeface. 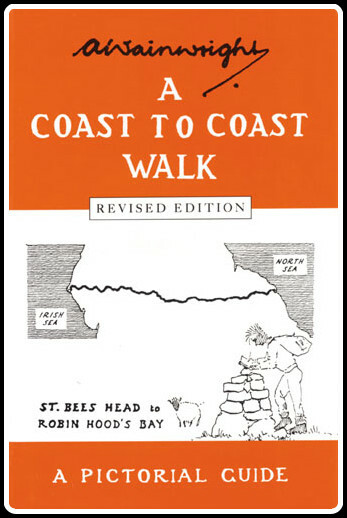 Wainwright came up with the idea of a west-to-east hiking trail across the neck of England in 1972. He had prepared a book about the Pennine Way in his own inimitable style back in 1968. The Pennine Way runs south-to-north for 267 miles (429 km) up the northern spine of England, from Edale in the Derbyshire Peak District, through the Yorkshire Dales and the Northumberland National Park, ending just short of the Scottish border. Wainwright wasn't that enamoured with that particular trail; in some closing comments at the end of his Coast to Coast book, he describes the Pennine Way as "far longer and a greater challenge to stamina, but most of it lies over dreary moorlands." The Coast to Coast trail, on the other hand, he writes, "is, in my opinion, immeasurably superior in scenic qualities although it has no Hadrian's Wall to stimulate the imagination ... [It] is enjoyable for its beauty, for the dramatic variations of landscape, and for its many interesting relics, some rooted in prehistory." He concludes his comparison of the two trails with this pithy statement: "I finished the Pennine Way with relief, the Coast to Coast walk with regret. That's the difference." 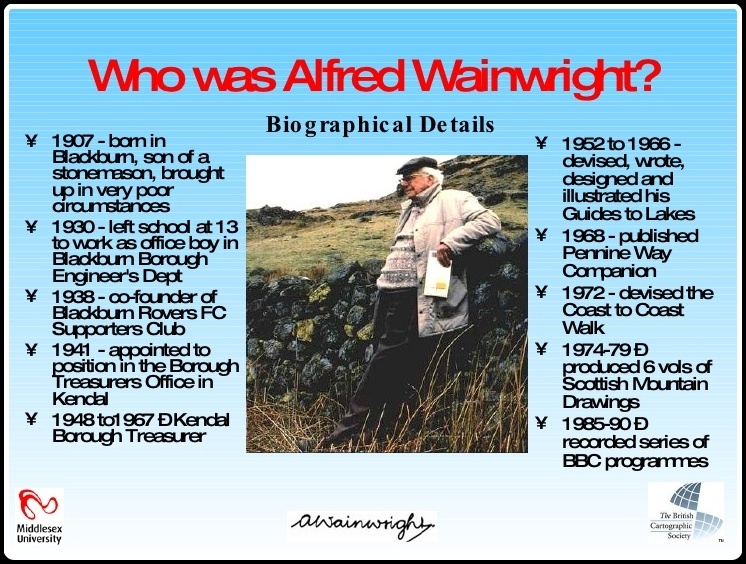 It took Alfred Wainwright a year to plan and explore his Coast to Coast trail. His scheme contained four main objectives: to avoid towns; to link together the three National Parks already there; to keep to high ground wherever it was practicable; and to use only rights of way and areas of open access. His book, A Coast to Coast Walk: A Pictorial Guide was completed and published in 1973 by the Westmorland Gazette. Because of legal restrictions that arose later (after land changed hands), and increasing traffic, and land erosion, the trail has had to be regularly re-routed over the years. Four revised editions of the guide have been published since 1973; the most recent was published by Frances Lincoln of London in 2003. Wainwright divided the Coast to Coast route into 12 stages. His idea was to have each stage end in a place where overnight accommodation would be available. Most of the stages he came up with began and ended with low ground, and included a single up-and-down stretch during the course of the day's hike. A couple of the stages were much longer than the average, and included more than one extended spell of steep walking. The majority of walkers these days tackle the trail in 14 or 15 stages. Hiking the trail every day for two weeks means a daily average of 14 miles (22 km). If you hike at an average speed of 2.5-3.0 miles/hour (depending on how much change of elevation you have to deal with), that means a daily hike of about seven hours. 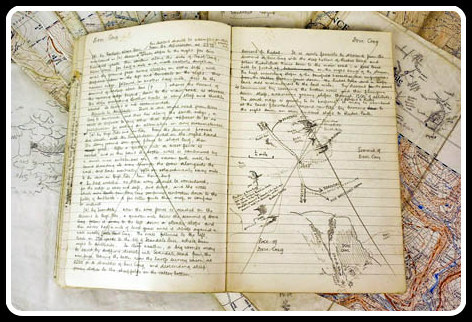 It needs to be emphasized, of course, that although Wainwright's trail is laid out in a careful and efficient way, there is no exact route you have to follow, and no single method of negotiating one's course across the country. The idea is to take the general idea, but to innovate as the whim takes you, or to adjust your plan in response to vagaries of circumstance — whether of human or natural causes. Our own approach, however, is set firmly by the pre-arranging all of our B&B and hotel accommodation. The main idea is to set oneself a challenge, but also to enjoy the entire process for its own sake. You're only going to do it once — presumably — so get the most out of it while you can. My friends Michael and Tony, with whom I attended boarding school in the mid-to-late '60s, will be my companions on this grand hiking adventure. We will be walking the Coast to Coast trail for 14 straight days from August 23rd. to September 5th. Follow our progress daily on this blog! Resources: A Coast to Coast Walk - Revised Edition (2003) by A. Wainwright, published by Frances Lincoln, London; Coast to Coast Path - Sixth Edition by Henry Stedman, published by Trailblazer Publications; Harvey Map XT40: Coast to Coast West (St. Bees to Keld) and Harvey Map XT40: Coast to Coast East (Keld to Robin Hood's Bay); B&B and hotel bookings and daily luggage-ferrying by Macs Adventure. Sounds great - I might join you! Have an enjoyable walk, Clive. Regards to your companions. And of course a wonderful retirement. Hi Clive, I do wish only that I could join you on this wonderful walk. Do enjoy this adventure. Hi Clive. When you said you were taking a trip to England, you neglected to mention this grand adventure you were about to undertake. Like the others, I also wish I was going with you. Do keep us posted! Ed (and Jo). Clive, when I first started reading Tony's post, I knew you would be one of the two friends he walked with. What a wonderful experience!